Just call. We'll tell you if we can help you. In many matters -- injury and malpractice, for example -- we work on a contingency basis, meaning that we are paid only if we are able to collect money for you. On other cases, our fees are hourly, or sometimes we handle a matter for a specific sum. Do I get charged for my first consultation? Most consultations are free. If there is a charge, we'll let you know up front. Can I call on someone else's behalf? What if I live far away from your office or I'm not able to come in for an appointment? In some cases, we can come to you. What if I don't have all of the documentation you need? It's best not to wait. We can assist you in obtaining what we need to see, or use our resources to get it. What if my case isn't one of your listed specialty areas? 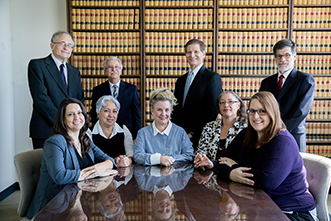 There are so many different kinds of legal matters we've handled since 1954, we couldn't list everything! But if we can't do it, we may know someone who can.